Over the last two weeks there have been 23 reports of burglaries around the island, which represents roughly two burglaries per day, and the police said “suspects have been identified and police are actively pursuing leads,” and also issued crime prevention advice for residents. 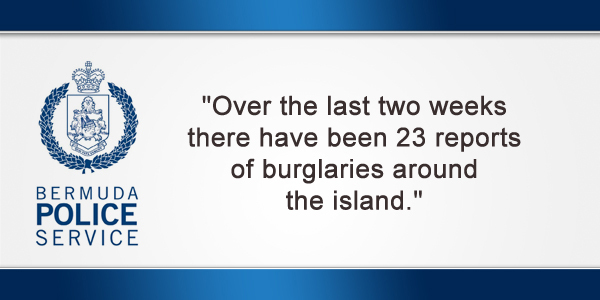 A police spokesperson said, “Over the last two weeks there have been 23 reports of burglaries around the island. Two in the City of Hamilton, two in Devonshire, one in Hamilton parish, four in Paget, four in Pembroke, three in Sandys parish, one in Smith’s parish, four in Southampton and two in St. George’s. “This represents roughly two burglaries per day, with most taking place during working hours [8am to 5pm]. “In a number of these incidents suspects have been identified and police are actively pursuing leads. Of note, the Bermuda Police Service would like the public to be vigilant as we have reports of two black males on a motorcycle working together. “Also, witnesses in the western parishes are describing another burglary suspect – a white male believed to be of Portuguese descent – who is very active in the Southampton area. 1. Secure your residence before you leave home [doors and windows]. 2. Where possible invest in a security system with cameras or a dog. 3. Take note of any suspicious people and or activities and report them [including any descriptions of height, complexion, clothing etc.] to police no matter how insignificant it may seem to you. 4. Be aware of any servicemen/tradesmen or workers that come to your home. Ask to see identification and call the business to verify before letting anyone in your home. If you are unsure or feel unsafe, do not engage – call the police immediately. 5. Avoid keeping large sums of money and jewellery in plain view in your home. Invest in a home safe and/or a safety deposit box. 6. Conduct a self-audit of your home – cut back trees and hedges to reduce vulnerable areas where intruders can attempt to access your property without being seen. The description of the portugese male sounds all too familiar. Without naming any names, I know the police and courts are fully aware of one who fits that description and has a notorious and terribly long history and record of burglaries, I think between 50 and 100. He went away to prison for a while, as he probably does now and then, and he always seems to fall right back into the same behavior again. Perhaps the police will know who I am speaking of as not many would fit this card, and maybe this can help them investigate. If that man is innocent I would feel terrible infringing on his privacy and dignity, so of course it is up to the police to do as they see fit and proper. If it IS him, and he is up to his old tricks, then our country could be facing a huge series of burglaries. 3 of these burglaries occurred a stone’s throw from my doorstep in a mature , close neighborhood . All during the daylight hours and in one instance there was a dog in the victim’s house and in another the folks were at home (house unlocked) and on the patio having tea. The perps could quite literally keep an eye on the residents while they were robbing them . If you see strange people and vehicles in your area make a note of vehicle description and license numbers . These guys have been confronted by residents in passing thinking they were friendly, nice guys and the perps even speak back with nice polite ‘good mornings’ so don’t be fooled ! Dogs are much more than security systems and require a lot of care and attention and resources to live happily.